Eagles Villas, partner property to neighbouring Eagles Palace, is a family friendly all-villa resort located near the ancient village of Ouranoupolis, Halkidki. 40 luxury villas are nestled into a green hilltop amidst Mediterranean gardens and command either beach or garden views. All three villa types are decorated with neutral tones and range in size from one bedroom to two. All feature a kitchenette and private plunge pool and most boast private gardens. In villa dining is of course available whilst a buffet breakfast is served in the main buildings restaurant along with lunch and an a la carte menu for dinner. When it comes to a tipple or two, enjoy a cocktail at the bar or a nightcap in the lounge. In the common areas palm, olive and pine trees grow and facilities include both an indoor and outdoor heated pool, a shaded pool for the kiddie's, access to the private beach, two tennis courts and the rejuvenating Eagles Spa. Villa guests are invited to use neighbouring hotel Eagles Palace's facilities including an award winning spa and private beach which runs an array of water sports and has a PADI diving centre. 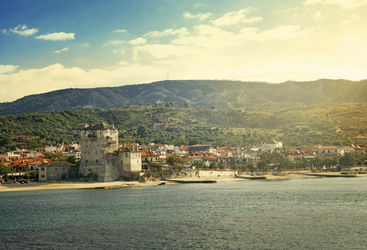 For the land lovers a visit to the ancient village of Ouranoupoli and a spot of wine tasting should secure a great day out. Take a dip in the plunge pool as the sun sets over the ocean. The views are incredible. Kate L is our 'Eagles Villas' expert and as a seasoned traveller has the inside track on the most memorable adventures.